Skewer prawns on bamboo skewers and arrange in a baking dish. Place cilantro, chiles, onion and garlic into a food processor; pulse until finely chopped. Add orange juice through pepper and process until combined. Pour marinade over prawns and let set 30 to 60 minutes. Grill prawns until cooked through, basting with cilantro butter. 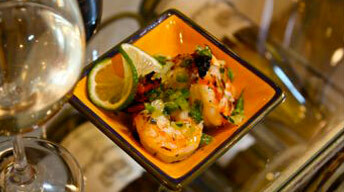 Squeeze fresh lime over prawns & serve. Melt butter in a small saucepan over medium heat. Add garlic and cilantro; cook 2 minutes, until garlic begins to soften, stirring occasionally. Set aside.